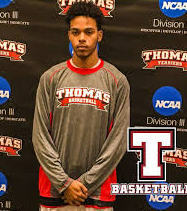 Mykal Glasgow and his Thomas College Men's Basketball teammates fell to Colby College 77-47 in a non-conference game at Larry Mahaney Gymnasium. The teams were evenly matched in the early part of the first, with Colby holding a 13-11 edge nine minutes in. Colby College quickly took control, going on a 9-2 run over the next three minutes to go ahead 22-13. Colby kept their distance and went into halftime with a 36-23 advantage. Colby started the second half with a 9-4 run that put them ahead 45-27 four minutes in. Colby College kept Thomas away and cruised to the 77-47 win. Patrik Lubin recorded his first career double-double, leading the Terriers with 13 points and 11 rebounds as well as three steals. Nolan Smeeton added nine points off the bench for Thomas.